SPC Solutions - Precision Tool Distributors, Inc.
MicroRidge was founded in 1983 by John Schuldt, President, and has built its reputation by developing and marketing microcomputer-based industrial software systems for statistical process control in lumber manufacturing to assist in lumber recovery efforts. 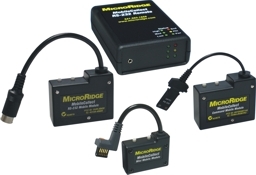 MicroRidge introduced the first portable lumber size control system to the timber industry and in 1988 introduced the first gage interface to the general manufacturing market. This early GageWay interface was a simple connection for Mitutoyo gages to a serial port on the PC. Today, MicroRidge has a suite of products designed to support tailored solutions. Our 1st generation GageWay Wireless was introduced in October 2006 and has led to the May 2010 introduction of the 3rd generation wireless - MobileCollect. These wireless systems work on the factory floor, in the lab or anywhere an individual needs to connect digital gages and RS-232 devices to a computer without the use of cables. GageWay interfaces directly link single or multiple gages and serial devices using RS-232, USB or network connections. Real-time data can be fed into Excel using our WedgeLink family of hardware and software keyboard wedges.